Winter is a time of long dark nights and icy gusts that cut through even the most well prepared cold weather outfits. Yet for many, there is still a lot of fun to be had closer to home, whether you’re building snowmen, enjoying a cup of hot cocoa around a fire pit or simply flopping in the backyard to make a snow angel. The downside is you’ll almost always end up a little cold and wet from any wintertime activities. The purchase of a winter patio heater can turn your short lived outdoor enthusiasm into a long lasting love of the colder months as you’re able to quickly warm up inside a bubble of amazing warmth, heading back out reenergized and refreshed. In this article we’ll review the best winter patio heaters, covering their various features, advantages and heat capacities. Our goal is to let you know what’s out there and how you can buy the best patio heater for your specific needs. We have taken the time to test these patio heaters in a variety of environments and made sure that no matter which you choose you can be sure you’re getting a quality product that will work for many season to come. We’ve compiled the table below with our top three choices for easy reference, but you can always click here to skip straight to our top choice. Our top choice for the best winter patio heater wasn’t the most expensive or the heaviest, but it did perform phenomenally and has a few awesome features that all the other unit’s lack. Our number one pick is the Golden Flame 46,000 BTU XL-Series Patio Heater. 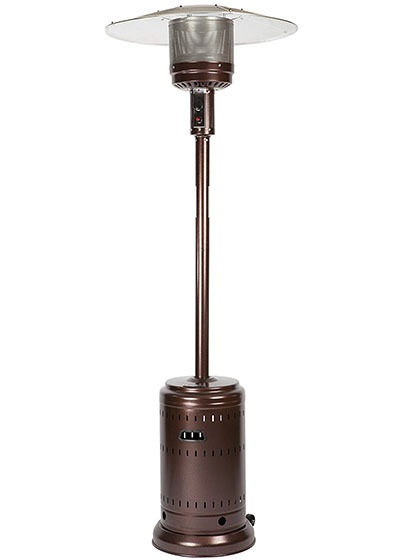 This unique mocha bronze colored patio heater is superb in the winter, and as the name suggests puts out a ton of heat. During testing we found we could stand over 9’ away and still feel the warmth of the powerful burner. Even in sub 40 degree weather this patio heater is able to warm the surrounding area to 60+ making for your own blessedly warm sanctuary. While that may not seem all that warm, the cooler exterior temperatures make it feel downright cozy. We loved the durable bronze finish that gave the Golden Flame XL-Series a luxurious and high end feel, plus the included wheeled base was perfect for positioning the patio heater in just the right orientation for that perfect fall day. On top of that, this unit was the only one on our list that comes with a weighted base. There is a small hole where you can fill the base with sand or water to give it some extra heft for added stability in high winds and extra protection against accidental trips or falls. In case it does tip over though, it has a built in tilt shut-off valve to ensure the flame harmlessly goes out and doesn’t cause any additional damage. 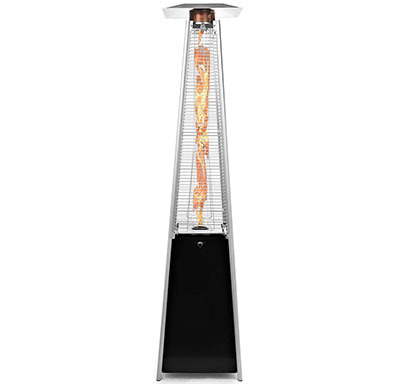 Overall this is an attractive and affordable winter patio heater that looks wonderful on any deck or backyard. Click here to read a few more reviews of the unit and be sure to pick up a stand-up heater cover for extra protection against the elements. When it comes to patio heaters for the fall and winter, the Fire Sense Commercial Patio Heater is a great option. With a toasty warm 46,000 BTUs of heat and an extended 10 hour burn time it will have no issues keeping you comfortable in the cold. Straight out of the box assembly was fairly easy and we had the patio heater up and running in under an hour. It came with high quality hardware and all the holes line up for easy set up. This winter patio heater uses a standard 20 pound propane tank that fits neatly under the lightweight cover near the base. Once we powered it up with the piezo electric lighter and adjusted the heat we were able to feel the warmth up to 8’ away which is perfect for outdoor parties and larger spaces. While we would have liked a weighted base for added stability, the Fire Sense Patio Heater did come with anchor holes on the base so it can be bolted to a wooden deck or concrete pad. If you’re planning to use this under a covered area be sure to leave at least 3’ of clearance between the top of the unit (7’5”) and the covered roof so you don’t accidentally start any fires. During the summer months it’s easy to move this patio heater out of the way with the wheeled base and lightweight design. If you plan to store this unit outside year long you’ll want to buy a fitted cover to go with it for added weatherproofing. Overall this is a great winter patio heater and does an excellent job of warming the surrounding area. Check out our full review or look at additional opinions if you want to get some other viewpoints on the heater before making a decision. The AmazonBasics Commercial Patio Heater uses a no frills design that works wonderfully. 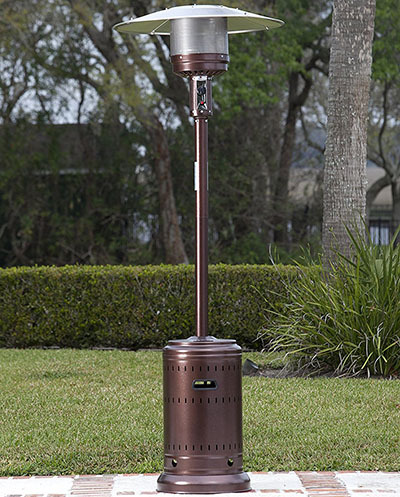 Standing at 7’5” tall and mounted on a rolling base this efficient winter patio heater can easily provide year round warmth. The dome type design allows for even heat distribution for added comfort and reliability. Plus, the sizable 46,000 BTU burner does an excellent job of keeping your guests warm in all but the coldest of temperatures. The entire unit is made from hardened steel and coated with weather resistant paint to ensure extreme durability and weather resistance. Safety wise this patio heater has it where it counts. With an included auto shutoff tilt-switch you won’t have to worry about burned decks if you accidentally knock the unit over and the extended height keeps little fingers away from the heating elements. The AmazonBasics Patio Heater comes in four great colors, to make matching your existing decor a snap. As with most patio heaters that are outside for extended periods of time we recommend you purchase a patio heater cover to go along with the main unit. 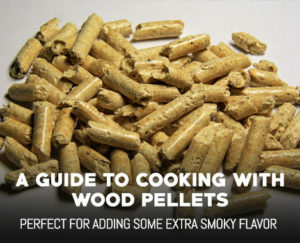 This will help increase the longevity of your heater and help reduce future maintenance. In summary this is a great basic patio heater with an awesome cost to performance ratio. We’d highly recommend you check out a few more reviews to see if this is the right heater for your patio. If you’re looking for a more visually appealing winter patio heater that provides great heat and has a stunning design, the Thermo Tiki OUtdoor Patio Heater makes for a wonderful choice. With a durable commercial grade design and an awesome display of flames this is the perfect focal point to your outdoor patio. Boasting an impressive 45,000 BTUs of heat output from the unique domed pyramid design, this patio heater can blast out a surprising amount of heat with fairly low fuel consumption. During our tests we found that even at over 9’ away from the unit we were still able to feel the warmth which was pretty impressive if you ask us. Similar to other high quality patio heaters the Thermo Tiki is equipped with an automatic shut off valve so in the event the unit tips over, the fuel will instantly stop flowing and the flames will go out. 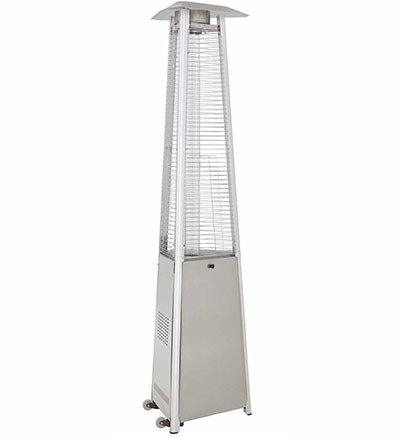 This outdoor heater also comes equipped with a protective mesh around the flame element to prevent serious burns and accidents. Also standard on the unit are a wheeled base for easy transport and an automatic ignition feature for easy one touch heat. No if only these came with a remote we’d be in heaven. The flame adjustment knob makes it easy to adjust the heat outputs and allows you to conserve fuel so you can eek out extra hours from your standard 20 pound propane tank. While this unit doesn’t come with a protective cover, we’d suggest you pick up a suitable cover for enhanced outdoor resistance. Overall this is the most stylish patio heater on our list and is sure to draw a few compliments from envious neighbors and guests. It is definitely worth it to look at a few other reviews for this heater so you can can see how truly awesome it is. For a winter patio heater, the Golden Flame True Commercial series is an excellent contender for the best patio heater around. With a hefty 41,000 BTUs of heat and a stunning stainless steel coated aluminium frame this unit is sure to be a incredible centerpiece for your winter festivities. We loved the unique multi-spark ignition feature which lit the Golden Flame the first time, every time. Plus the wheeled base made re-positioning the unit a snap as we could simply roll it across our deck and deposit it wherever we wanted. Size wise this unit is the largest on our list, with a height of 7’10” and weighing 64 pounds you can rest assured that pushing over this patio heater on accident is near impossible and it is robust enough to stand up to even the worst nature can throw at it. We also were pleased with the quick assembly time, all the hardware came on a convenient labeled cardboard insert that made finding the right bolts and bolts super simple. During our burn tests we were able to get around 8’ away from the unit before the heat started to fade which is more than enough for a typical patio configuration. Also with the included extra thick glass quartz tube it was mesmerizing to see the flames dancing around in the chilly fall air. It almost looked like they were alive as they shot upwards, and even the kids stopped to admire them for a moment or two. Once we were done for the night we let it cool off and put a protective cover over it to further strengthen it against the elements. This is an excellent choice and definitely ranks as one of the best winter patio heaters with a stunning design, warm flames and simple operation. If you’d like to know a bit more about it, check out a few more reviews of it here. So What is the Best Winter Patio Heater? If you’re more worried about performance and features than overall looks the Golden Flame 46,000 BTU XL-Series Patio Heater should be your number one choice for a patio heater. 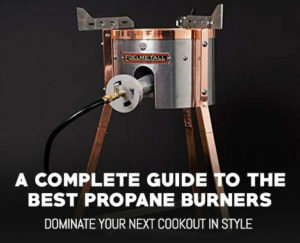 It can pump out some serious heat and has all the features you could ever want. If instead you’re a bit more concerned with the overall look and durability of the unit, the Golden Flame True Commercial series is the one to get. With extremely solid materials, a wonderful heat profile and stunning looks it’ll be sure to heat your patio in style. 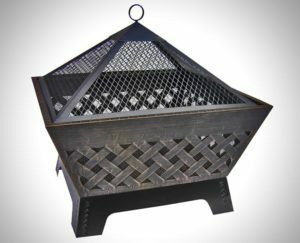 If for some reason you haven’t decided on any of the above winter patio heaters, you can always check out some of our fire pit reviews or even look into a more upscale fire pit table for additional heating options.